It is often assumed that most of the oil can be pumped and recovered from an oil pool. Unfortunately this is rarely possible even with the use of horizontal wells. Oil wells drilled in the Southern United States have an initial recovery rate of 20 percent. 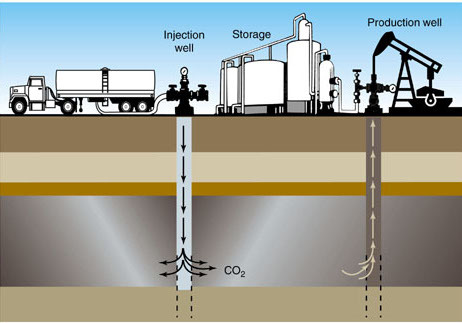 Enhanced recovery techniques such as water flooding and carbon dioxide flooding are then employed to extract an additional 40 percent of the oil. The remaining 40 percent of the resource is still untapped. This may seem insignificant until one looks at actual number of barrels of crude. American researchers in Mississippi hope to tap into the 40 percent of which remains in most petroleum reservoirs after use of standard production techniques. What is really interesting about their research is the method to be used. It is environmentally friendly and initial costs seem to be very affordable. Indigenous bacteria are injected into the oil-bearing formation. The particular bacterium flourishes in this environment and eventually changes the pathway of water injection. This forces oil into new channels and accumulations of oil. Coupled with carbon dioxide flooding this will result in much greater recovery of oil than either previous technology alone. It will be interesting to see how successful this experimental project is. Researchers are hoping for high recovery rates. At the current price of crude even a small increase in recovery can be very significant.